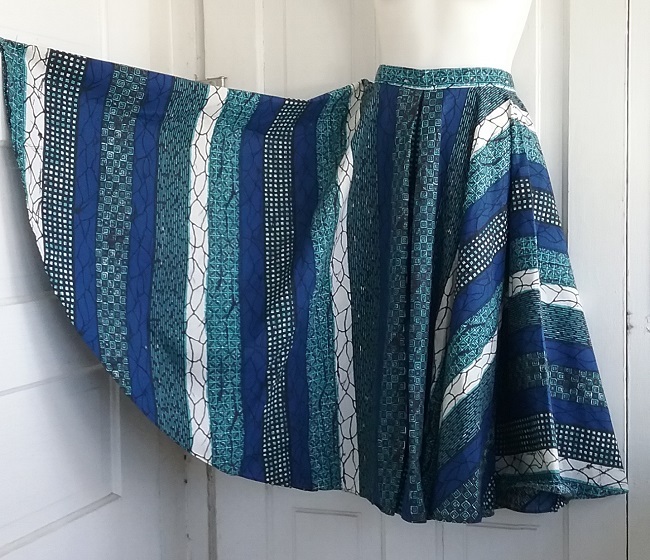 Those of you who have been reading this blog a while know I’m interested in more than just old clothes. 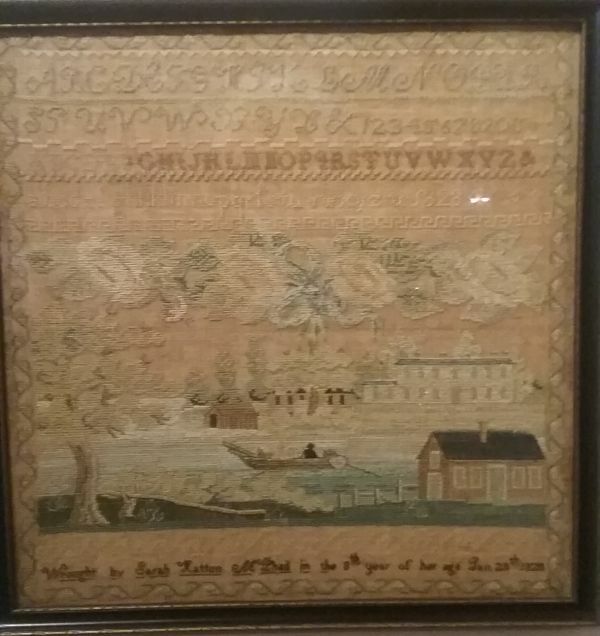 I also love reading about the Southern textile industry, and especially in how it operated in my state of North Carolina. Like much of the rest of the South, cotton grows in NC, though not where I live in the a bit too cool for the crop mountains. 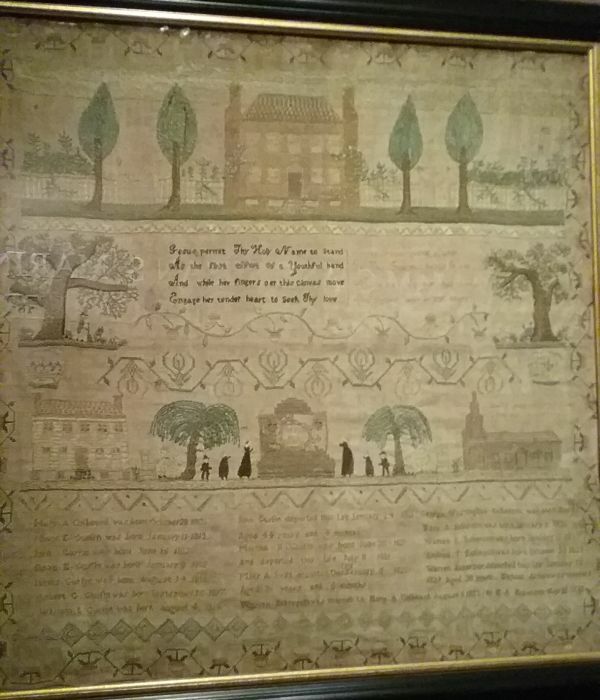 As a kid I had cousins who lived in the textile town of Gastonia, and even then I was fascinated in the difference in their way of life as cotton mill kids, and that of mine, whose father worked making paper. 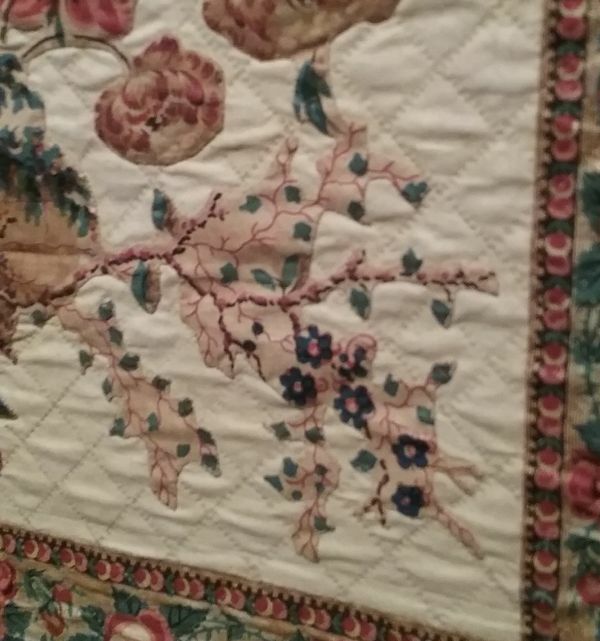 Even though the Asheville area does not grow cotton, textile industries developed in the mountains after the arrival of the railroad made getting the cotton here very easy. Most of the businesses made hosiery, but there were sewing plants as well. The denim-weaving center was a few hours east by rail, and so small jeans and overall factories were scattered across the mountains. 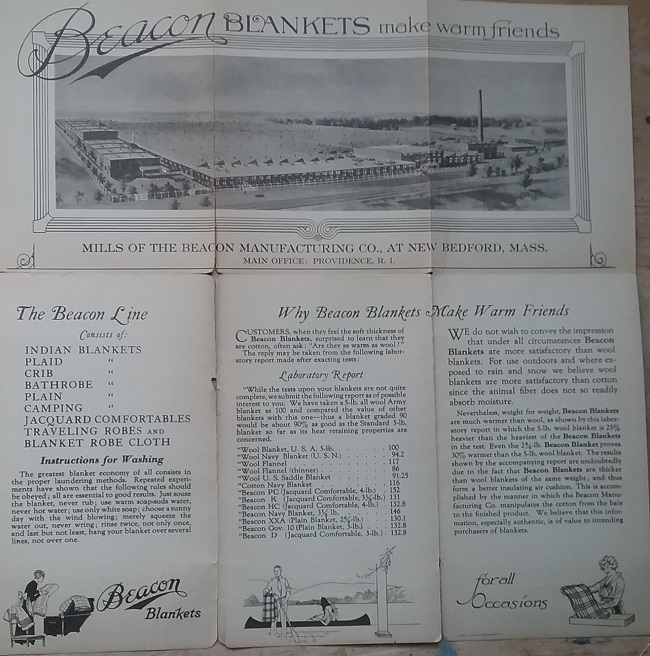 I recently found a little brochure published by Beacon, telling consumers (and retailers) why they needed to use cotton, rather than wool, blankets. 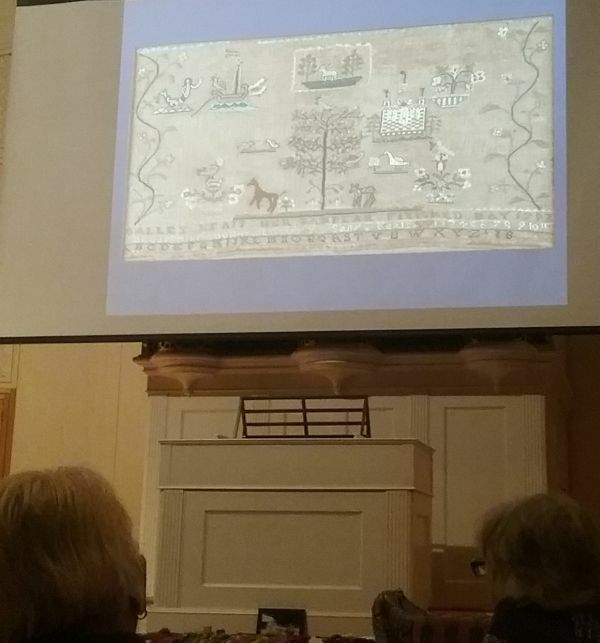 At the top is a drawing of the massive factory at New Bedford, MA. 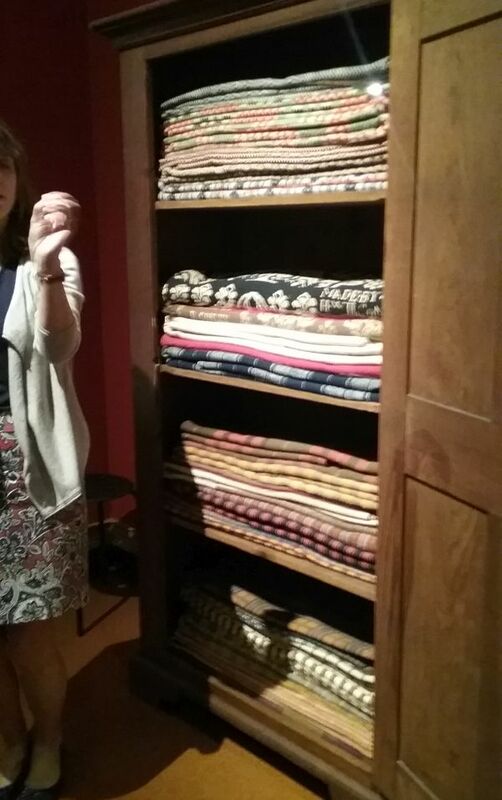 Beacon was a vertical factory, meaning that the entire process of blanket-making happened under the same roof. They collected cotton waste from other industries, reprocessed the fiber, spun the yarn, dyed it, and loomed it all in the same facility. There’s no date on my brochure, but because it shows the facility in Massachusetts, I can assume that it was before the 1925 move to North Carolina. 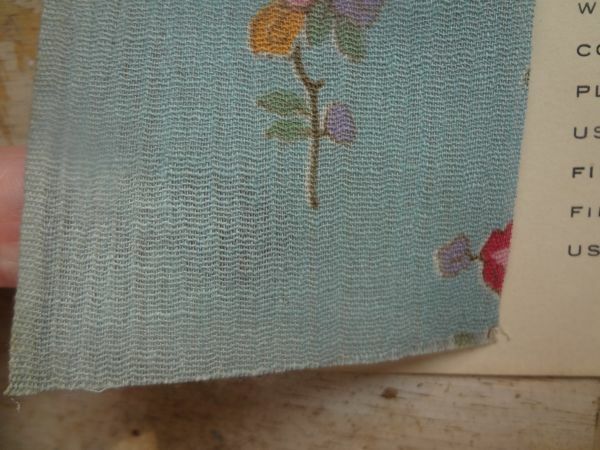 Another clue is the cover picture of the Indian, and the use of “Indian Blankets” in their product line listing. 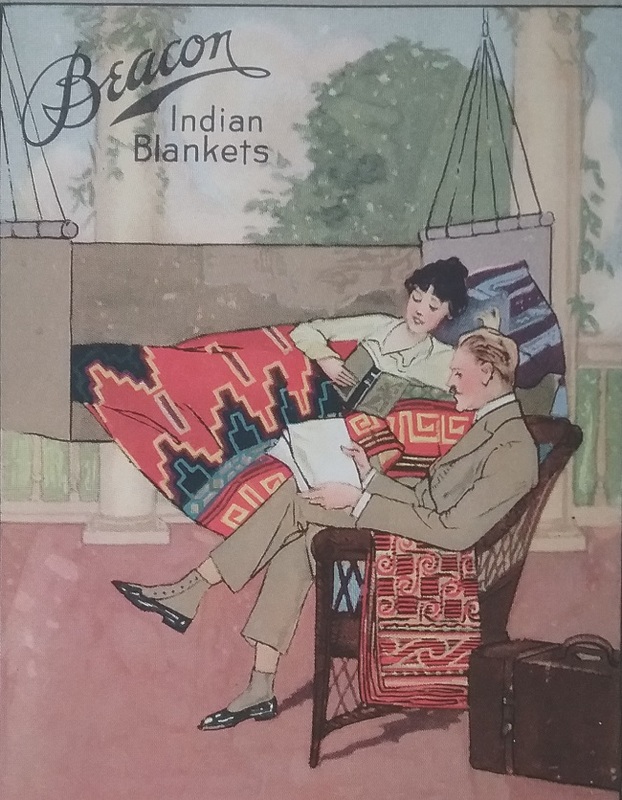 In 1930 Beacon was sued by the Navajo Nation because Beacon’s use of images of Native Americans and the term “Indian Blankets” seemed to imply that the blankets were Indian-made. 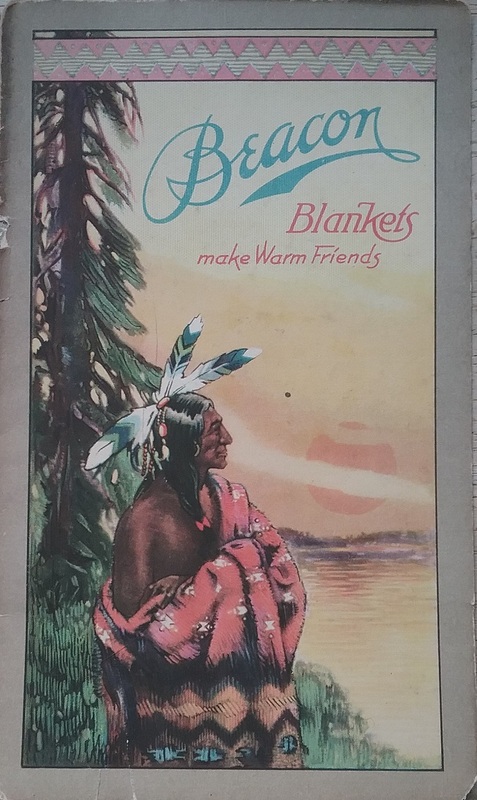 After 1932, Beacon had to drop the phrase “Indian Blanket” and limit the use of images that implied the blankets were Native-made. 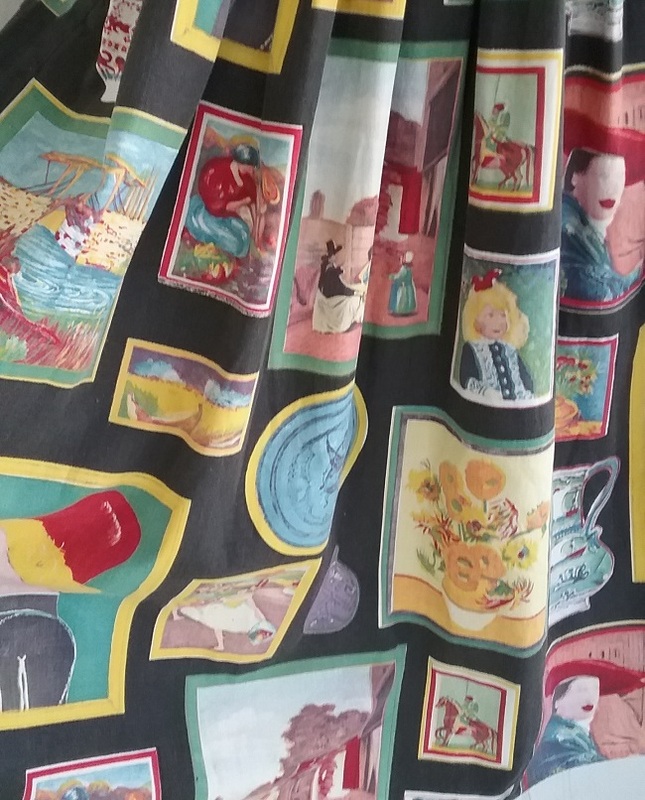 But the best indicators of age are the lovely illustrations of people using Beacon Blankets. 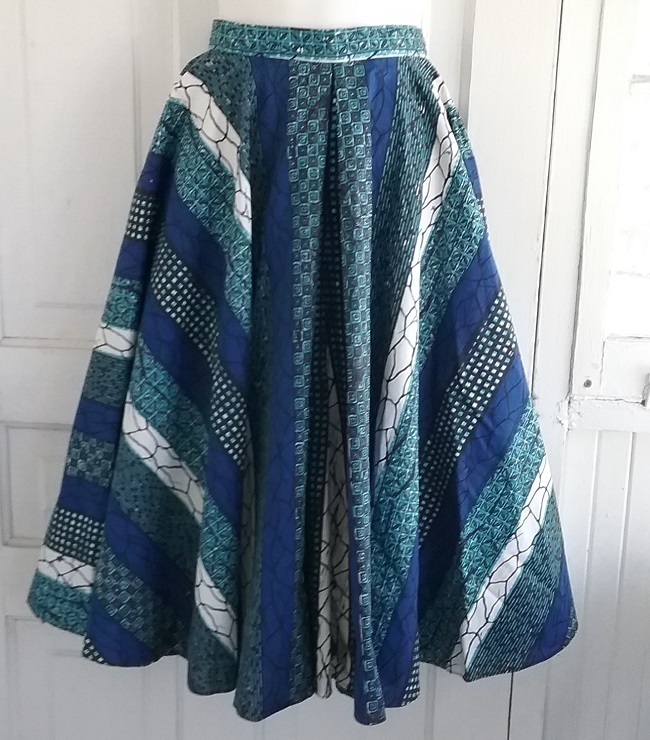 Skirts (and nightgowns) are several inches off the floor, and most of the women still have long hair. 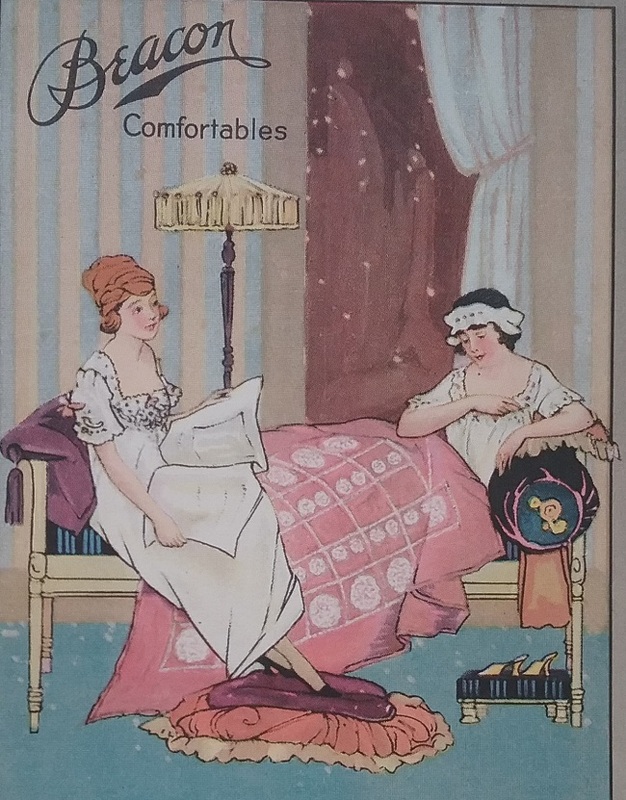 The illustrations show the loose waistline of around 1919 to 1921. It’s very slightly raised in some of the pictures, as you see in garments just before the waistline dropped to the hips in the later 1920s. 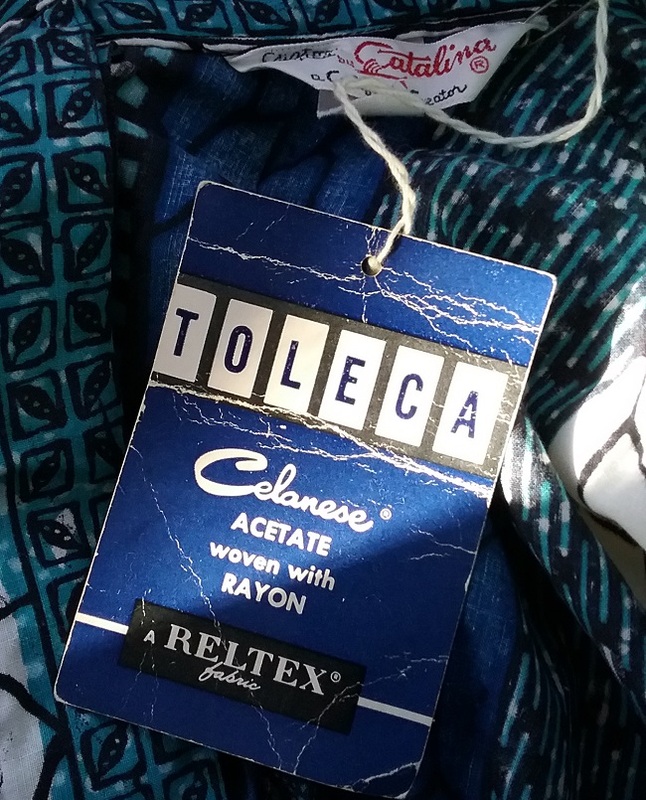 Beacon not only made blankets, they also manufactured what they called robe cloth. 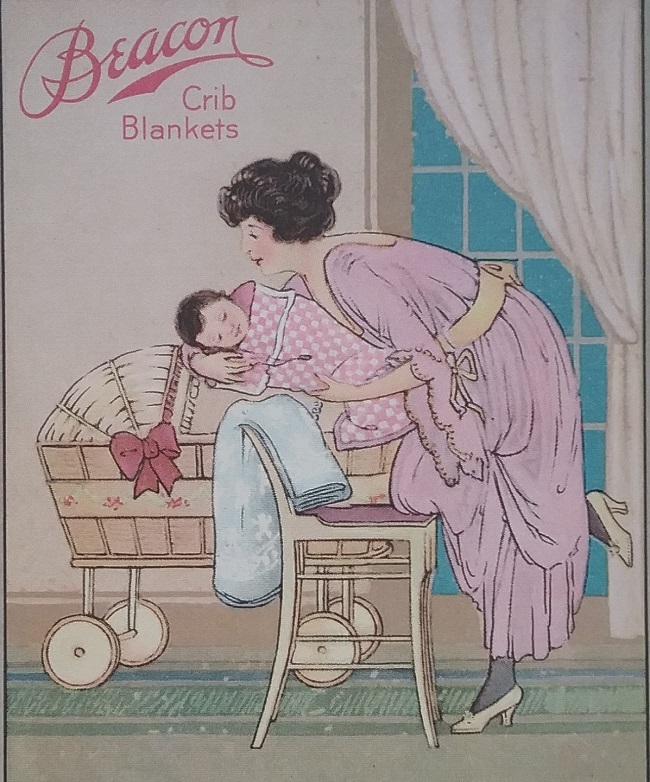 It was a bit lighter weight than the blankets, and was sold to both robe manufacturers and to home sewers. 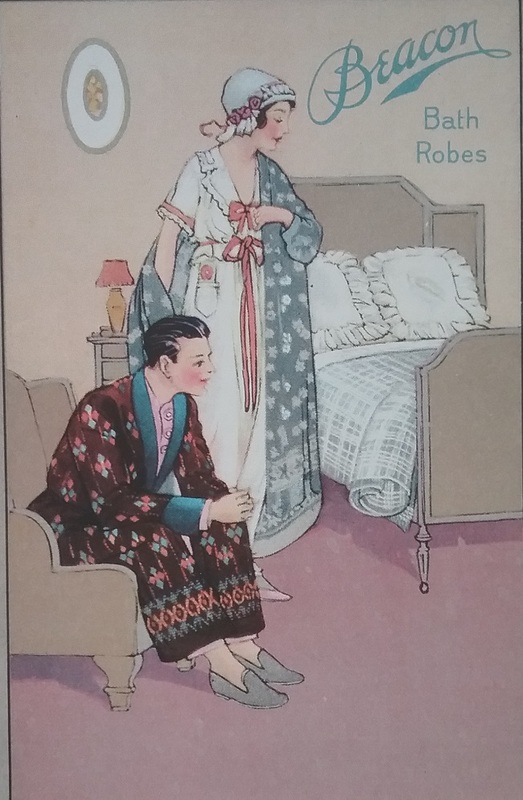 If you look in a vintage mail order catalog, it is likely you find both the finished robe and the robe cloth yardage for sale. If you watch old movies and television shows, it’s quite likely that you’ve seen Beacon robes in action. Last night an early 1960s episode of The Andy Griffith Show was playing, and Floyd the Barber was wearing one of the best Beacon robes I’ve ever seen. 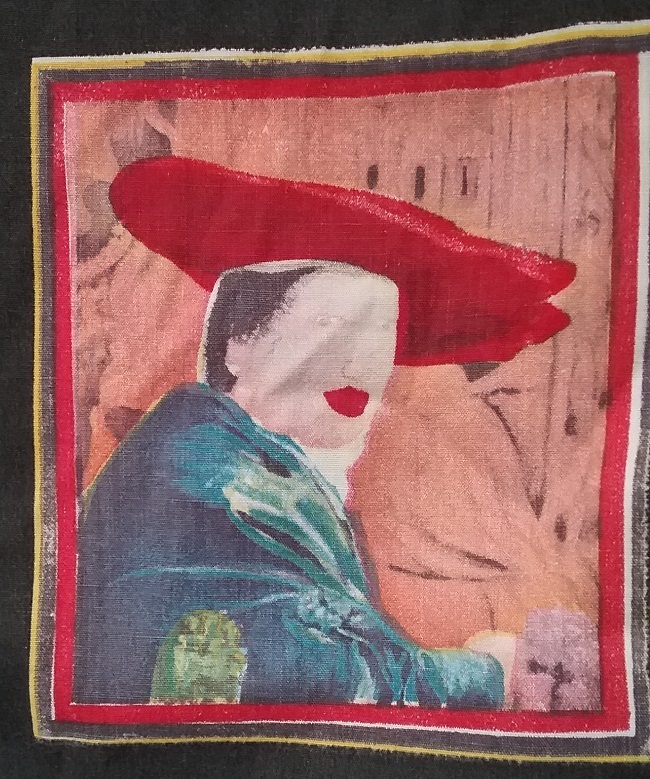 Of course, by 1960s, his robe was terribly old-fashioned, which was the point. 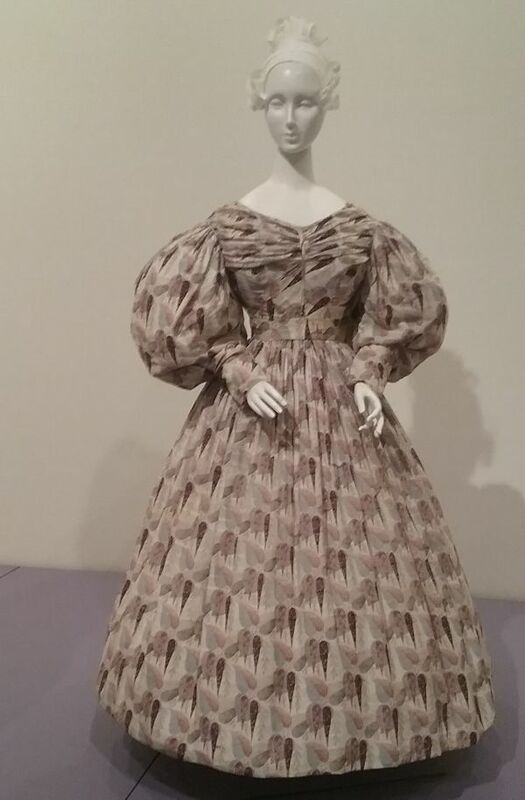 Because the topic of the symposium was Fashion and Technology, and the Cincinnati Art Museum was a sponsor of the symposium, I’d guess that it’s not a coincidence that the museum had an exhibition also titled Fashion and Technology. 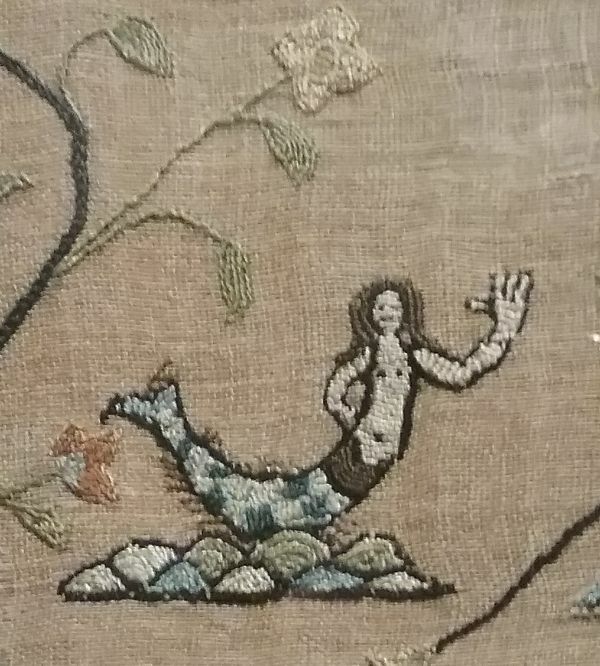 I think that we most often think of LED lighting and 3-D printing and smart chips embedded in clothing when confronted with the idea of technology in fashion, but we need to remember that technological advances in clothing date back to the fig leaf. 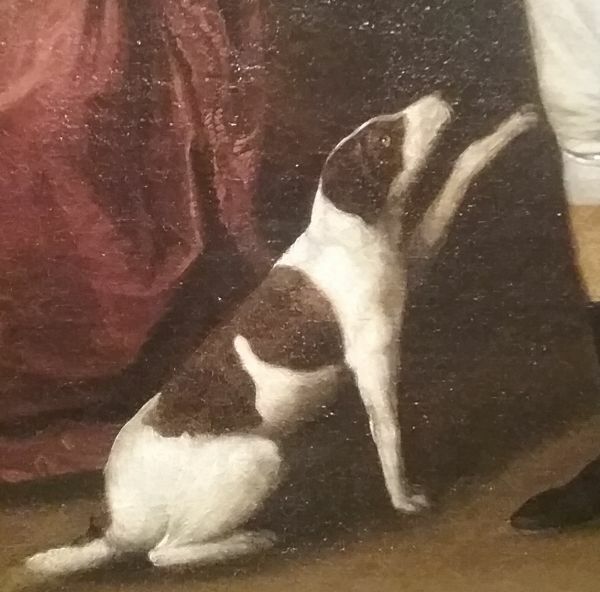 This small but well-curated exhibition covers roughly one hundred years, starting in 1780. 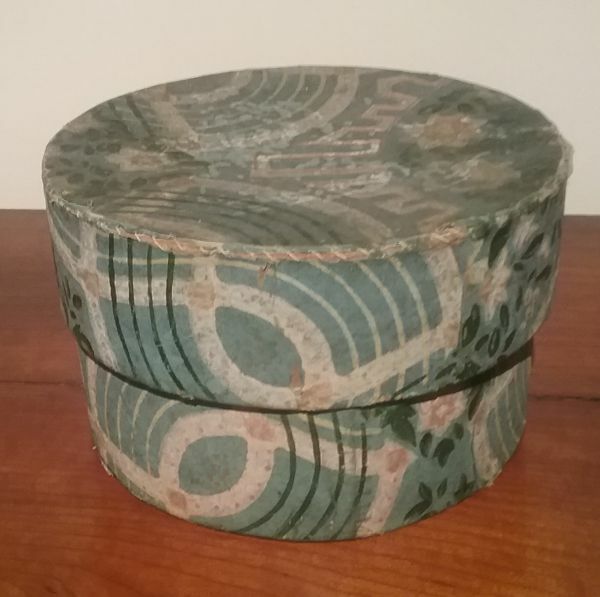 The dress above shows a very old method of making printed fabrics – that of using hand-carved blocks that were used to hand print the design. 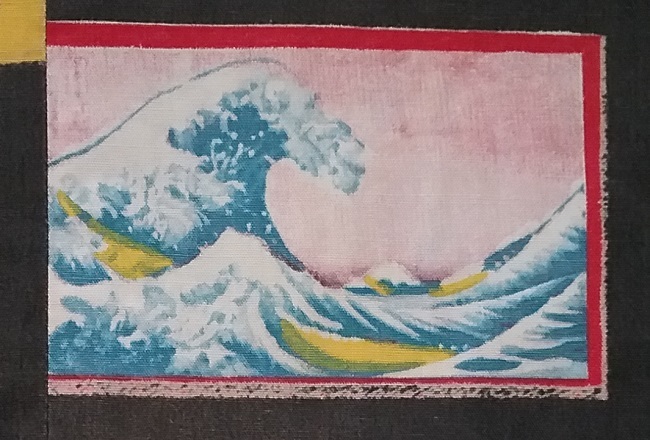 It was effective, and made beautiful designs, but the process was very slow. Multiple blocks had to be used, one for each color in the design. 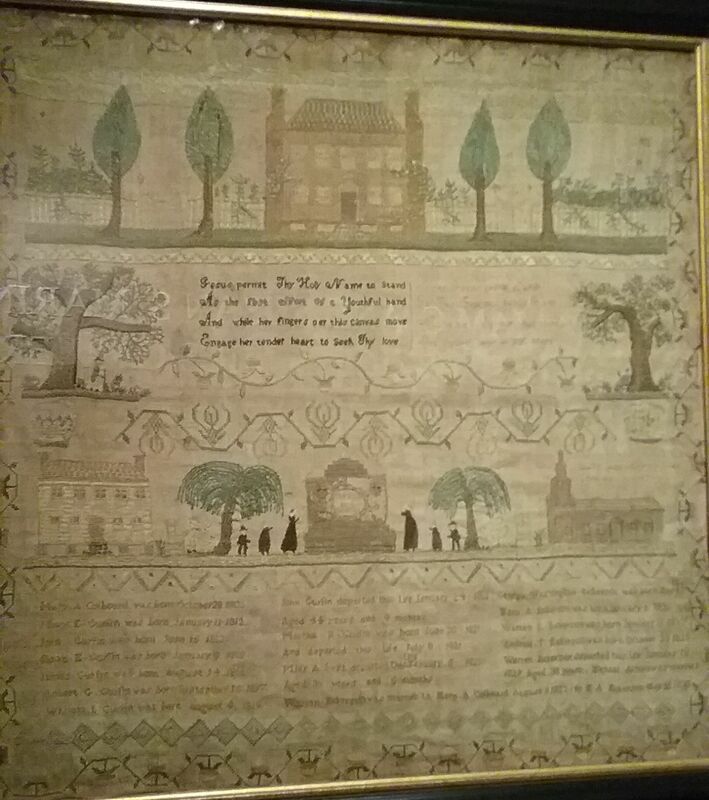 A big step forward came around 1800 in the form of roller printing, in which mechanized rollers were used to print onto the fabric. 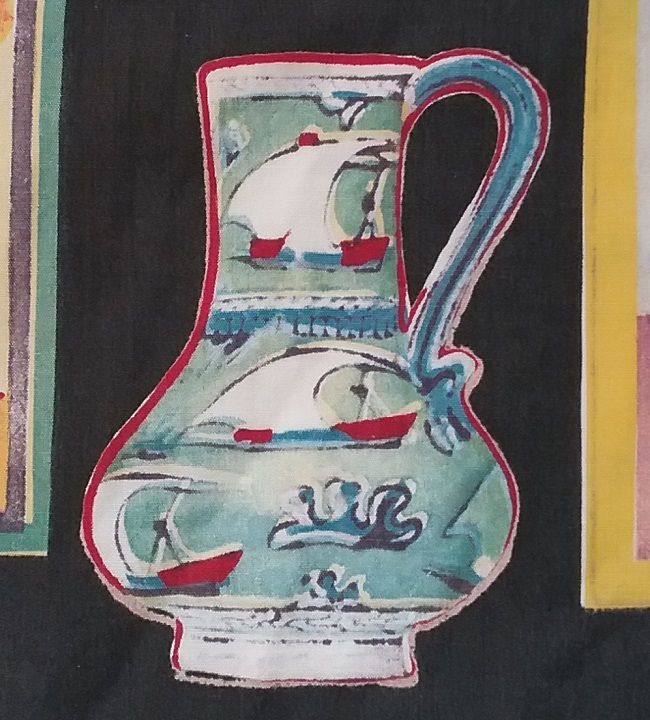 There was a similar process, using cylinders to mechanically apply the dye. 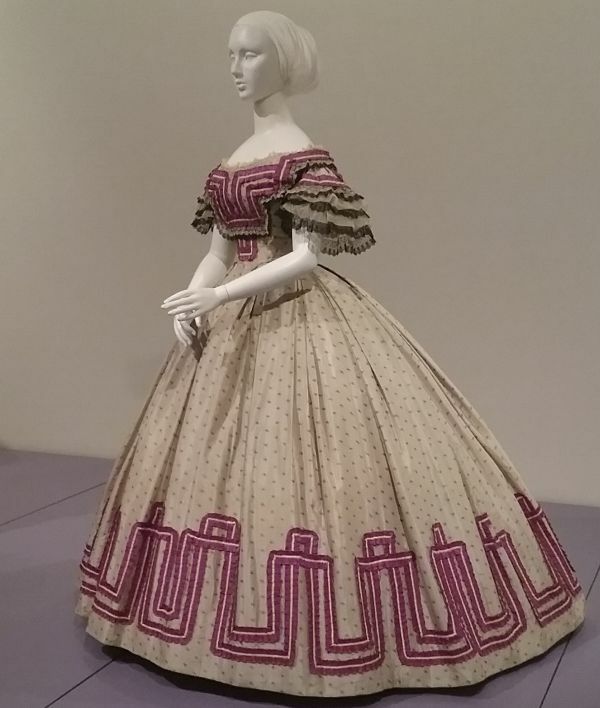 The fabric used to make this circa 1830 dress was most likely printed using a combination of the two processes. 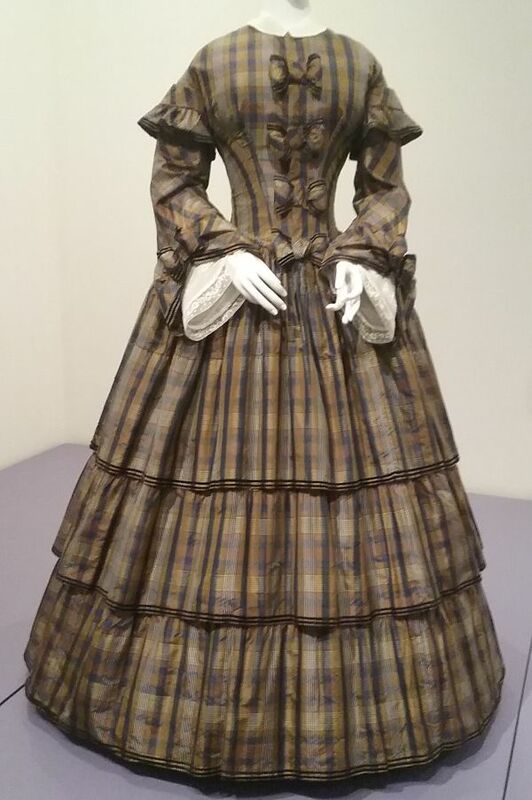 This circa 1850 dress helps illustrate the advances made in dye production. 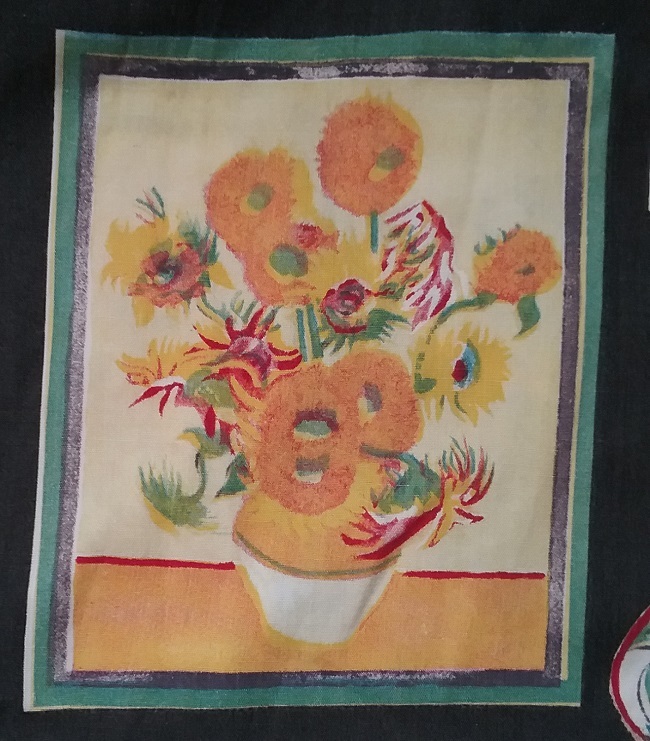 Synthetic dyes were developed in the late 1850s, and before that time, dyes were made from natural materials with a mordant added to help set the color. 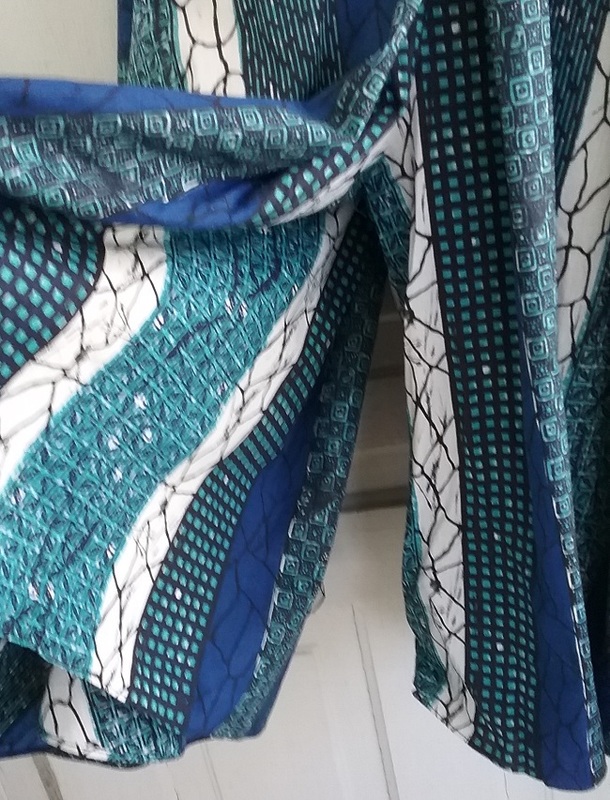 The plaid in this dress was produced by dyeing the threads different colors, and then setting up the loom to produce the pattern. 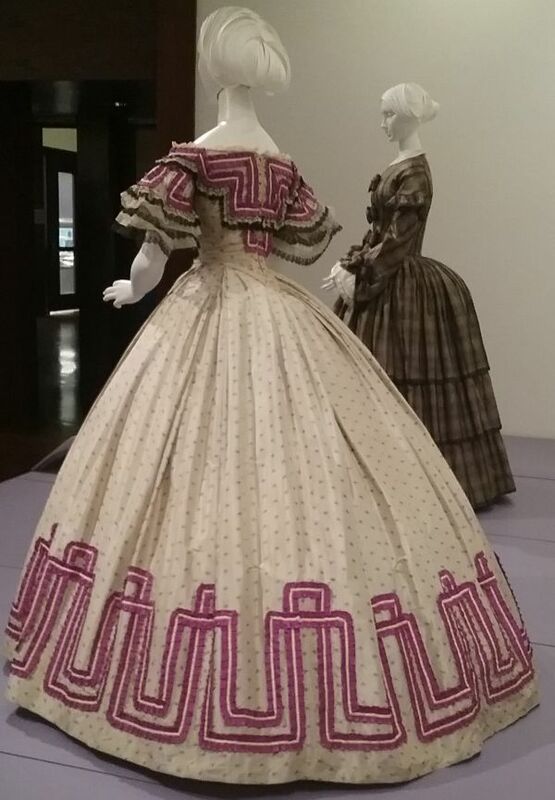 The creation of mauveine, the first practical synthetic dye, in 1856 brought spectacular colors to fashion. 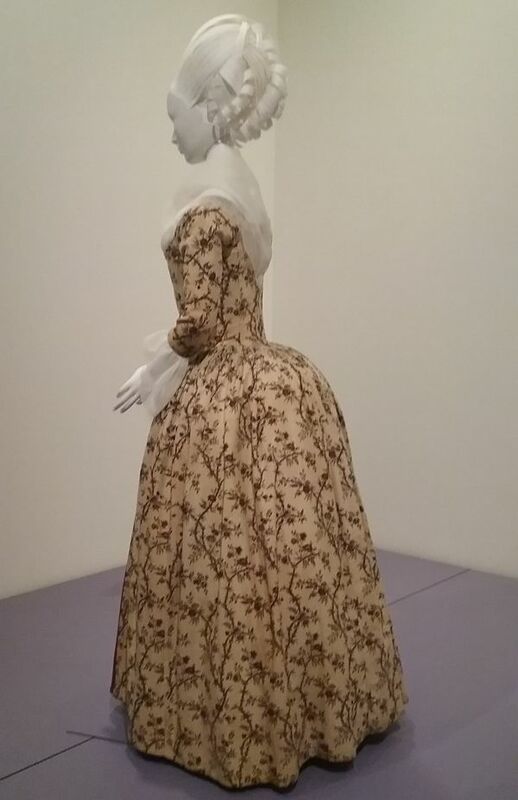 This circa 1863 dress has synthetic purple trimming, and the little flowers in the print are mauveine. Another technological advance seen in this dress is the use of machine-made lace. 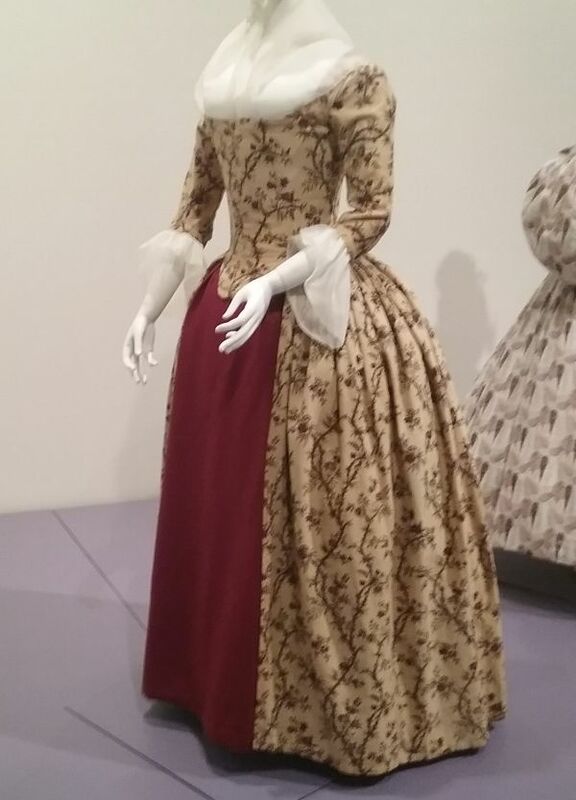 As a side note, like many dresses of this period, this one has two bodices. The second bodice is in storage, and we were able to see it on our tour of the storage area. 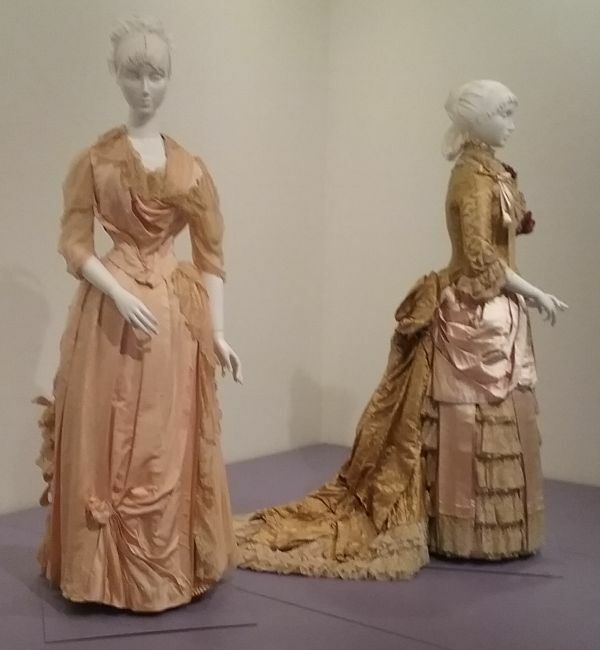 Here we have two dresses of roughly the same era, The dress on the left is by Paris couturier Jacques Doucet and dates to around 1888. Even though machine made lace was common by that date, this dress is embellished with handmade lace. Maybe the woman for whom this dress was made wanted to incorporate a piece of heirloom lace, or may she just wanted to show off her wealth. 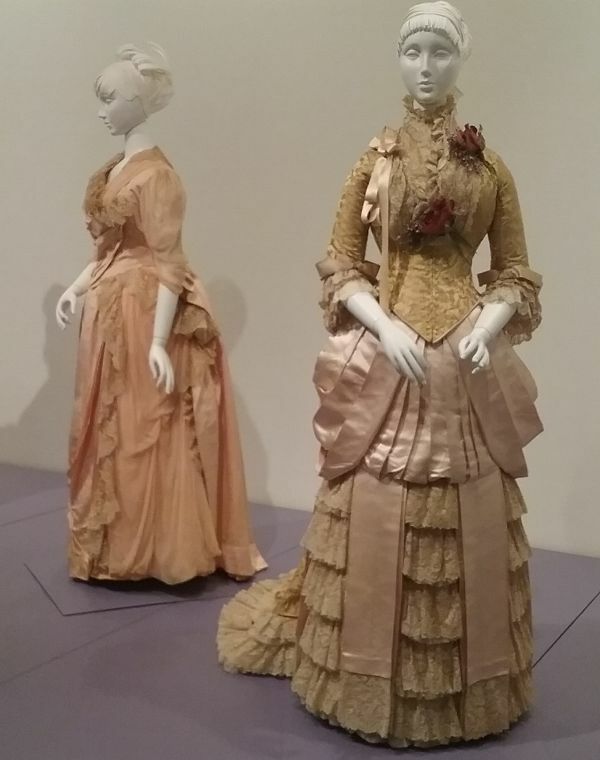 The dress on the right is from a few years earlier, but here the couturiers, Moret et Moncuit, used machine made lace. 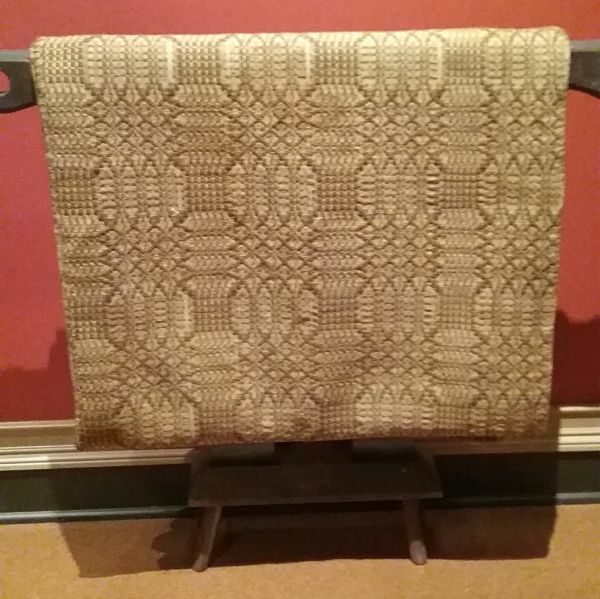 Because machine made lace was less expensive than the handmade variety, more of it could be used to embellish a gown. 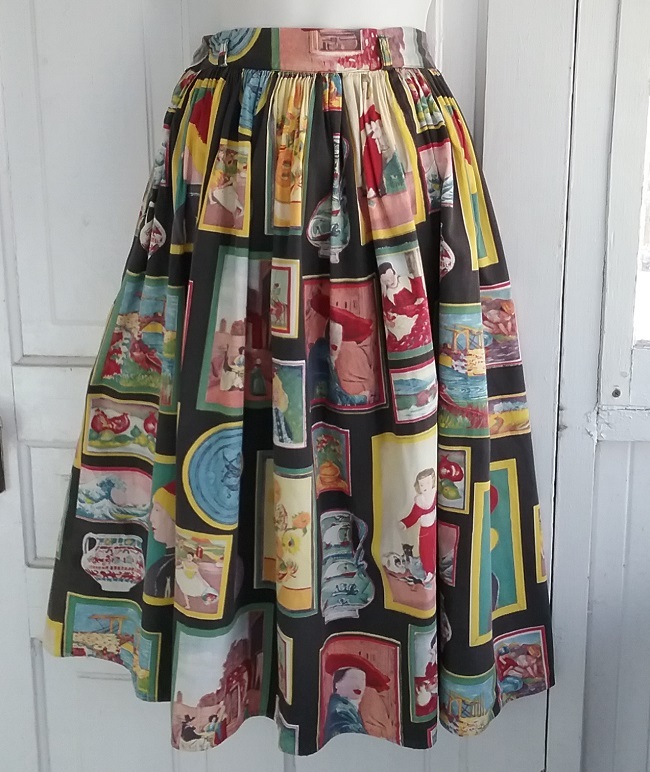 I’m guilty of looking at a pre-twentieth century garment and only seeing the design. Fashion and Technology shows us there is so much more to see. With all the talk about Made in America and bringing jobs back to the US, it is easy to look at the textile and clothing industries through rose-colored glasses. 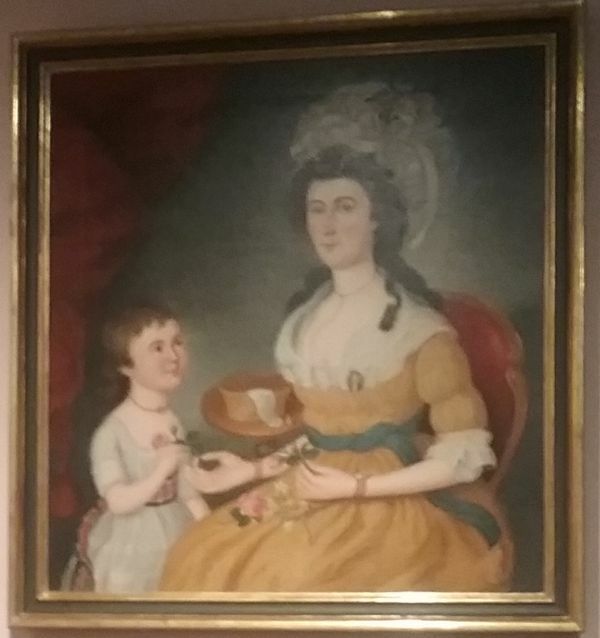 I was reminded of this yesterday while visiting the Upcountry History Museum in Greenville, SC. Like many cities in the Carolinas, Greenville was built on the textile industry, and the city really suffered when fabric and clothing makers began closing due to foreign competition starting in the 1970s. Today, however, the city seems to be doing alright. There is a downtown that is returning from the brink of emptiness, and they have an arts center, Heritage Green, that is simply amazing. Are the textile jobs missed? Yes, I’m sure they are. 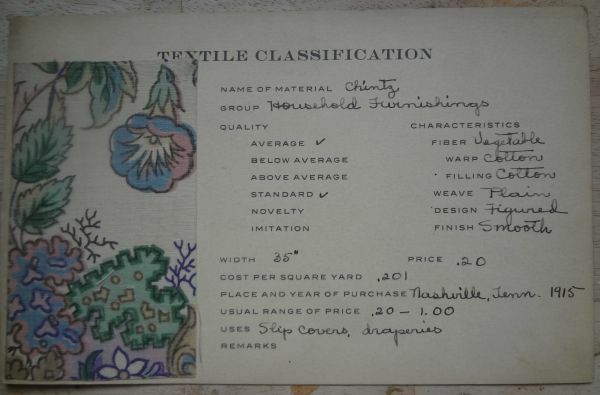 Would it be possible to return textile jobs to Greenville? I have my doubts. Would people even be willing to work in a textile mill like the ones that closed? My guess is no. 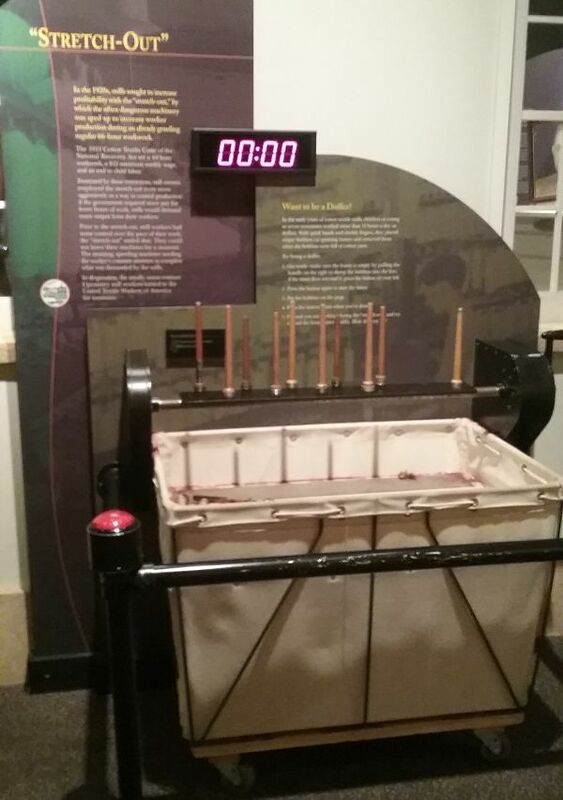 Along with this weaving machine, the museum had audio to simulate the conditions inside a cotton mill. 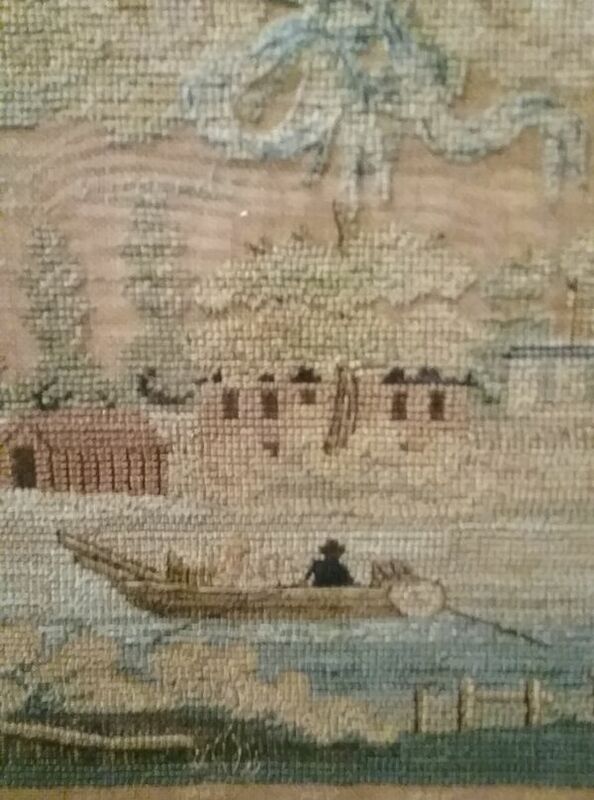 The background photo shows the rows and rows of machines, all noisily running to produce the cloth. People had to yell in order to be hear above the din. And look closely at the vertical belt that connects the machine to the source of power. See the wisps of cotton? Cotton was everywhere in the mill, and workers inhaled a lot of it. Many became sick with “brown lung.” My father’s youngest sister died from it. 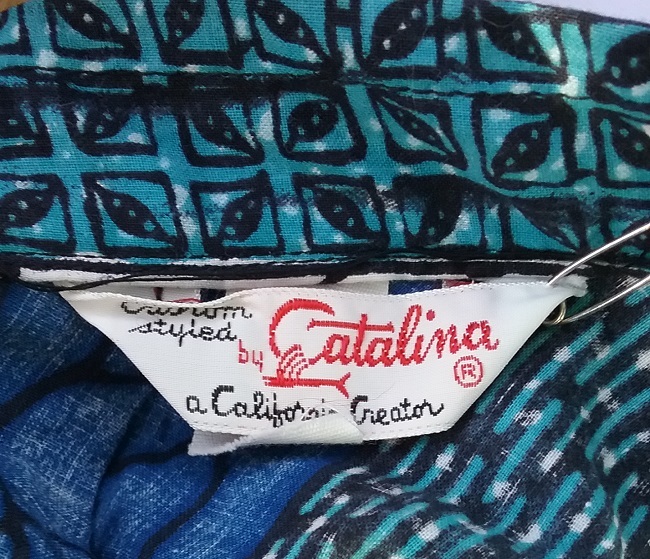 As time progressed, textile technology improved, something that did not stop when textile jobs first began moving to Mexico and Central America in the 1970s. 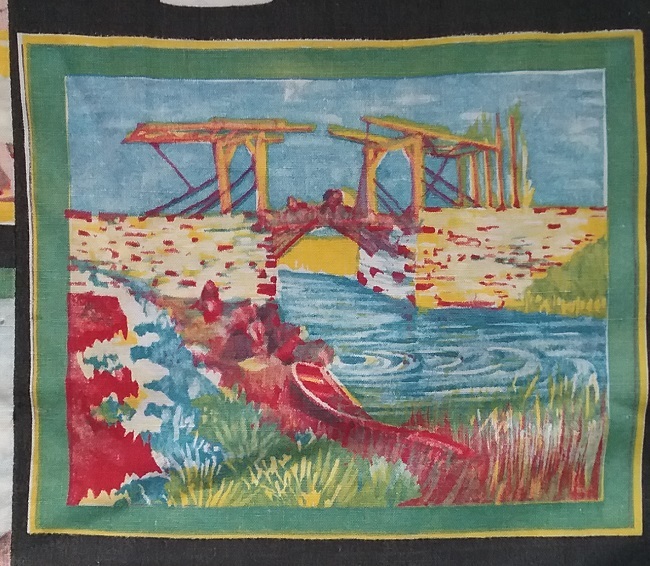 My guess is that a textile worker who lost his job in 1985 would not recognize a modern textile plant, with so many of the jobs once done by humans now being done by computers and machines. And that is the first major obstacle to returning textile production to the US. Technology has progressed to the point where we don’t have the trained workers in the US who could run a modern textile mill. 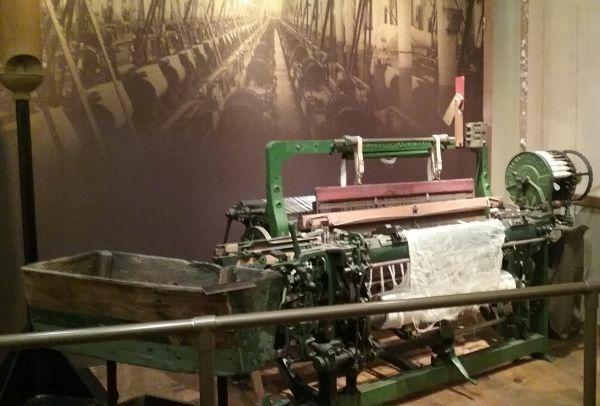 We don’t have the machinery, except for these examples found in museums and in rare factories like the White Oak denim plant in Greensboro, NC. Some sewing factories have even had a hard time finding enough workers who can run an industrial sewing machine. 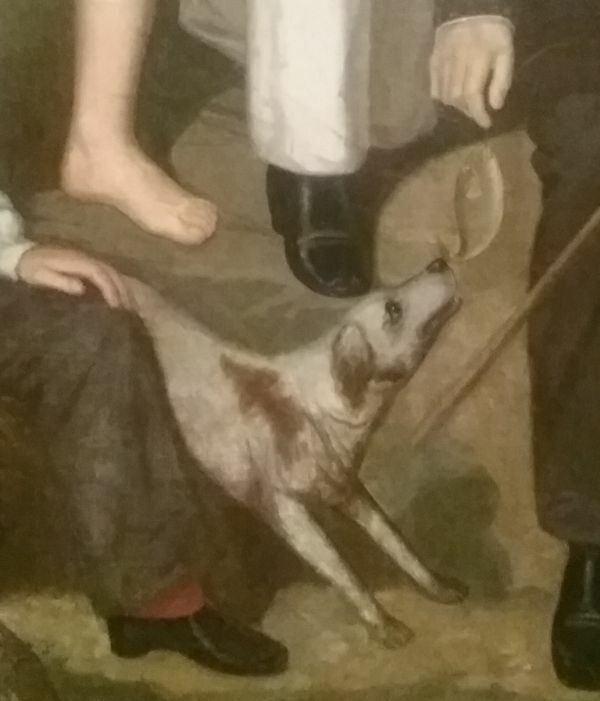 The museum has this great display on the “stretch-out”. 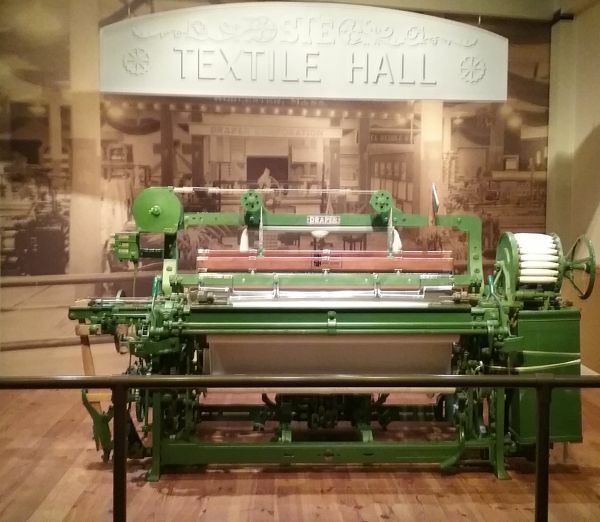 The stretch-out began in the 1920s, when in an effort to increase profits, doffers, the workers who tended machines and removed ( or “doffed”) bobbins holding the cotton yarn from a spinning frame and replaced them with empty ones, were given more machines to tend. Slower workers were fired, and the ones remaining had to pick up the slack by tending more machines. 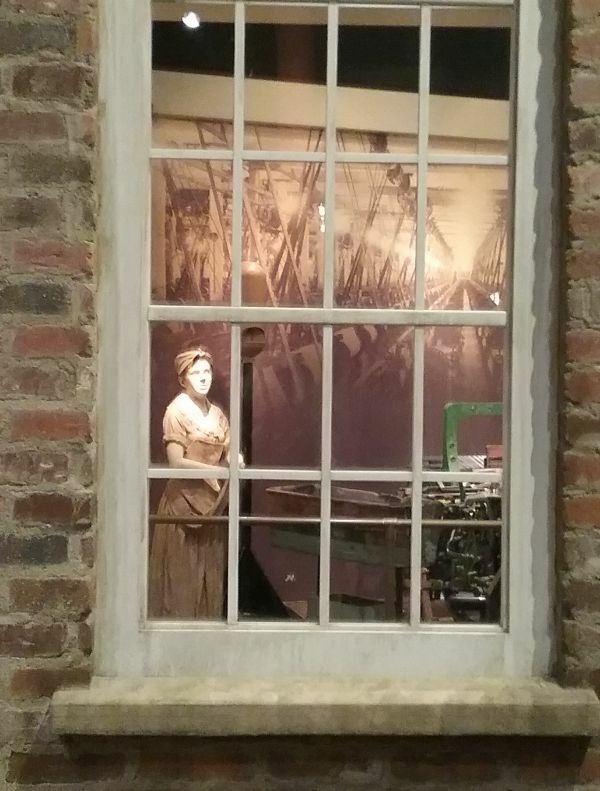 The museum let visitors time themselves at a doffing task, and then see if the time could be improved upon. If not, then I guess you would be history at that mill. The president-elect has said that tariffs will be imposed on products imported into the USA as a punitive measure toward those who do not produce in the USA. I’ve said in the past that this is not such a bad idea, but the truth is, whether tariffs are imposed, or whether firms move to US production, people had better get used to paying more for their clothes and other textile products. Unfortunately, even in the USA, we have garment workers who make less than the pitiful minimum wage. Jen recently posted this link to a Department of Labor investigation, and it is eye-opening. As much as we would like to think that Made in USA insures an ethically-made product, I’m afraid that is just not the reality. The current federal minimum wage, the lowest amount a worker can legally be paid, is $7.25 an hour or about $15,080 per year, before taxes, for an average full time worker. To put that in perspective: The current poverty threshold for a household of one is $11,880. The bottom line is that there are no easy answers, no easy solutions. 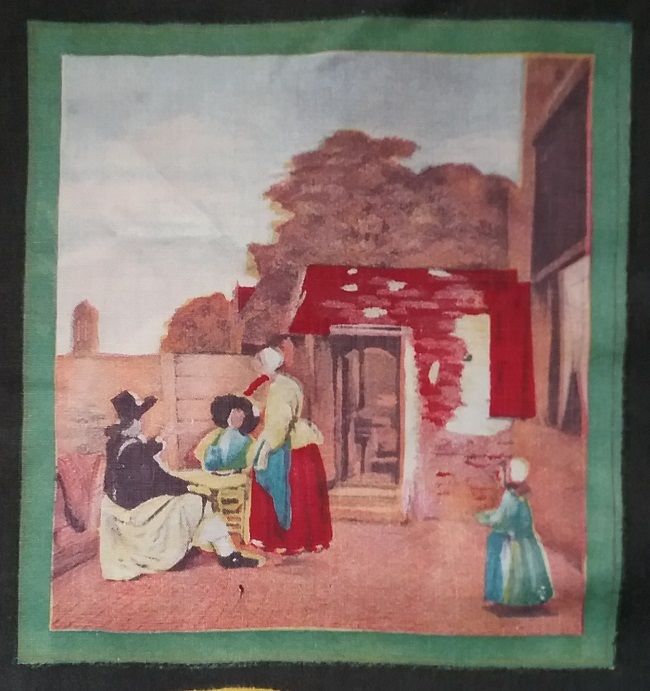 The textile and clothing manufacturing industries have a very long histories of abuses and of circumventing law and human rights. And when things improve for workers, this industry has a long history of packing up and moving where workers are more desperate for jobs and thus will tolerate less pay and dangerous working conditions. It gets worse. I recently posted a link to a company currently making camping clothing in the USA. As it turns out, that company has ties to a White supremacy group. Thanks to a reader who looked a bit closer at the company, I was alerted to the problem and quickly took down the link. Do I want textile production to return to the US? Of course I do, but I could do without the abuses of the past, and of the industry as it exists today in Asia. This is just not a simple issue. 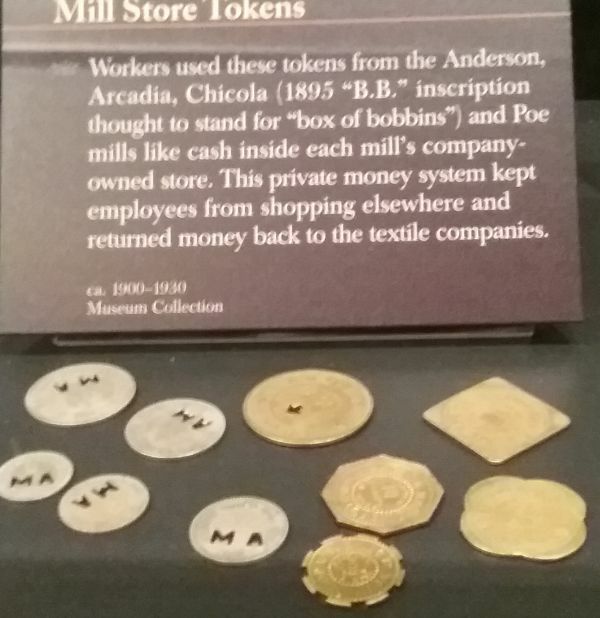 I’ll conclude with photos of company store tokens and coupons. Remember that old Tennessee Ernie Ford song, “Sixteen Tons,” in which he sang, “I owe my soul to the company store”? 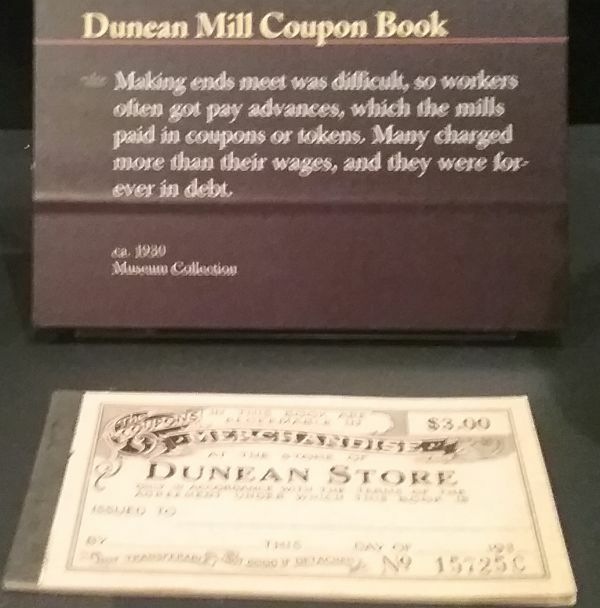 It was a common practice for workers to need a cash advance on their meager wages, and the payback was in tokens that could only be spent in the company-owned store. With a system like this it was impossible to ever rise above the debt. 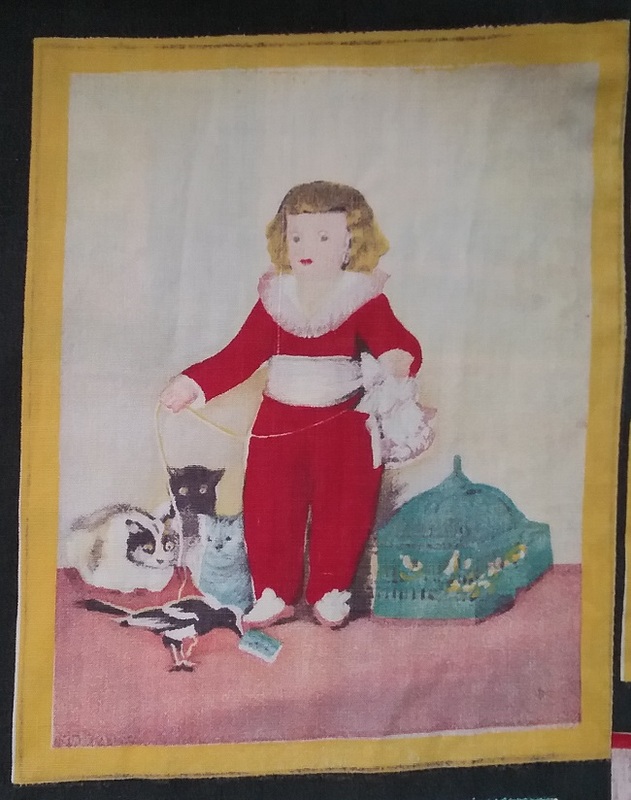 I had an interesting estate sale find recently. 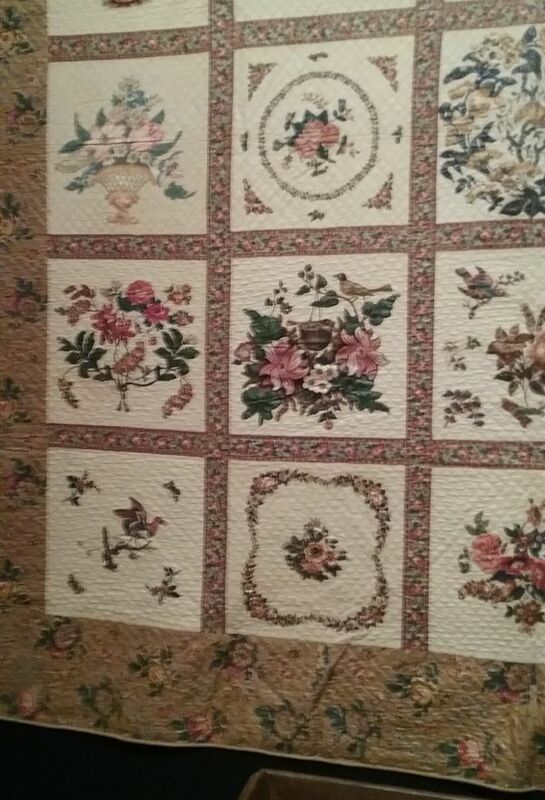 The card above was only one of about one hundred cards with fabric samples. What makes these so interesting is that these were part of the coursework at George Peabody College for Teachers in Nashville, Tennessee. 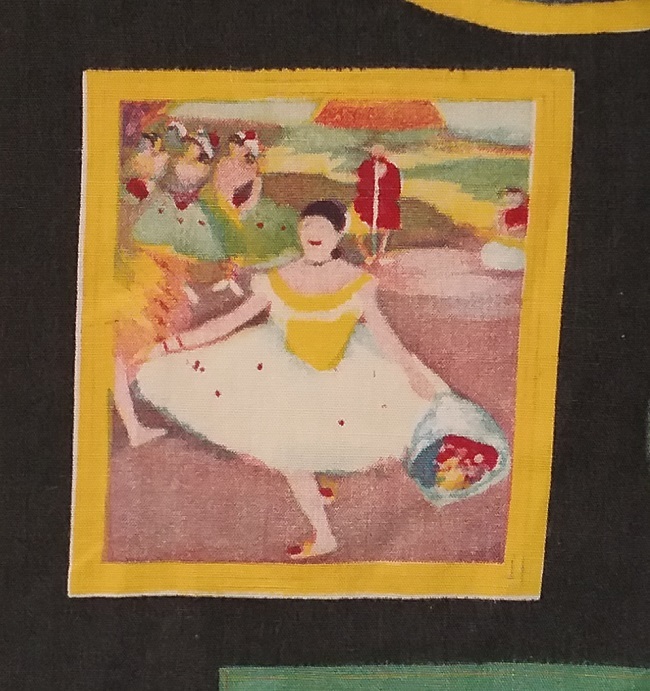 The cards were completed in 1915 by student Mamie Newman. 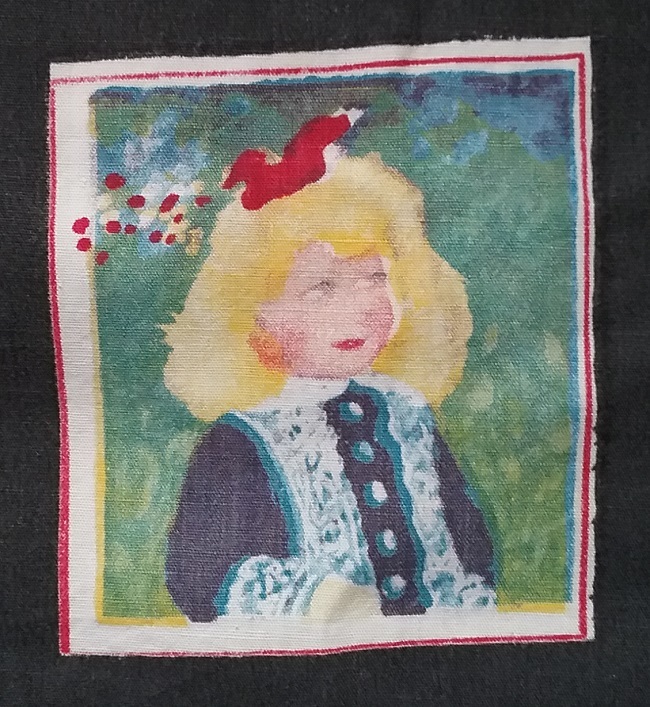 The cards were designed by Blanche E. Hyde. 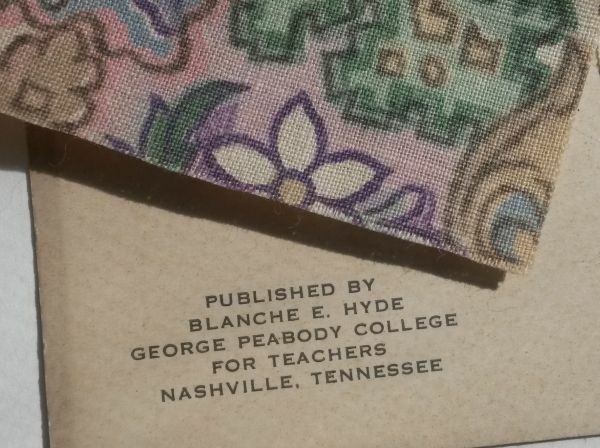 The only information I’ve been able to gather about Ms. Hyde is that she was a teacher at Peabody. My guess is that she was in the department of home economics. In addition to Miss Newman’s notes, some of the cards have corrections written in by the instructor. 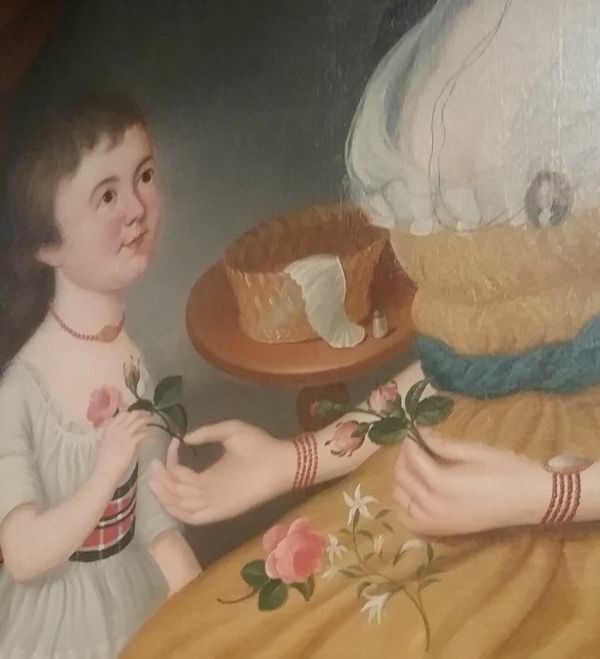 Ms. Hyde, perhaps? 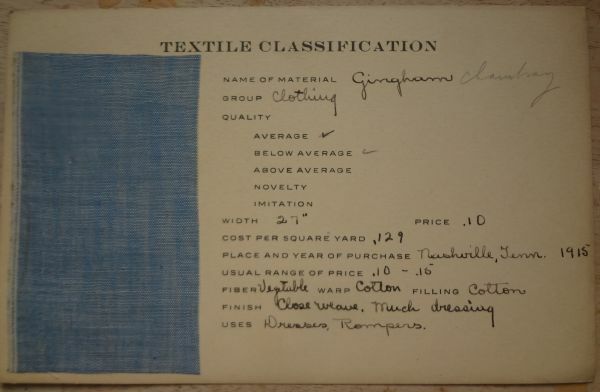 Miss Newman misidentified the chambray, and noted that it was of average quality. 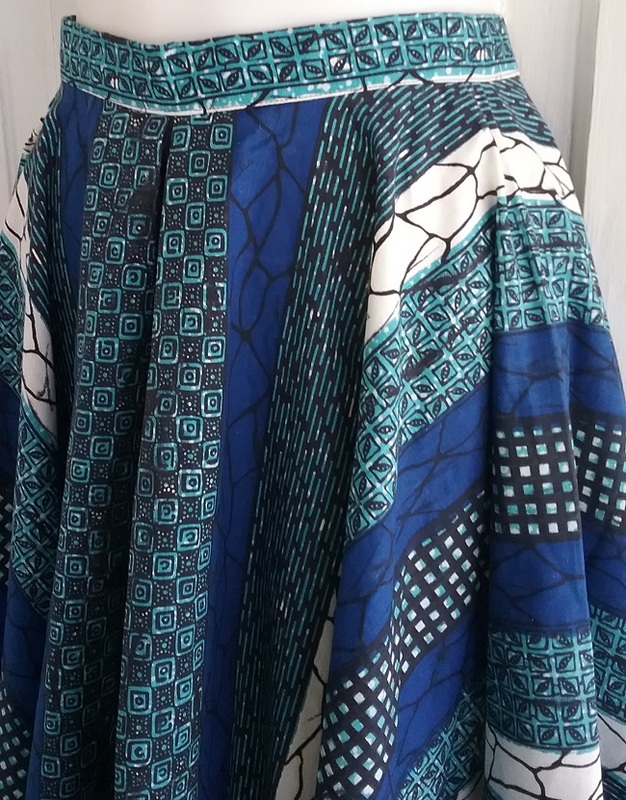 The teacher’s opinion was that this fabric was below average in quality. 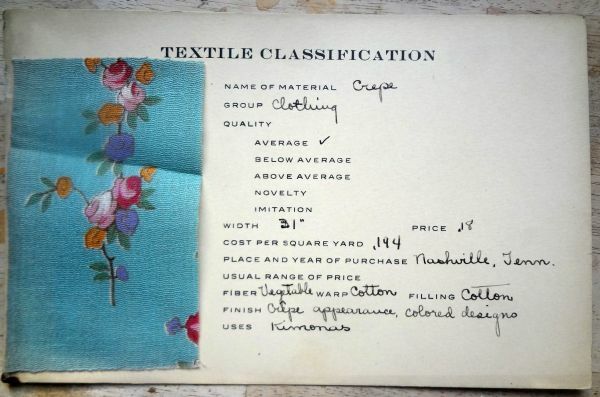 I just know I’d love to find a chambray of this quality today. 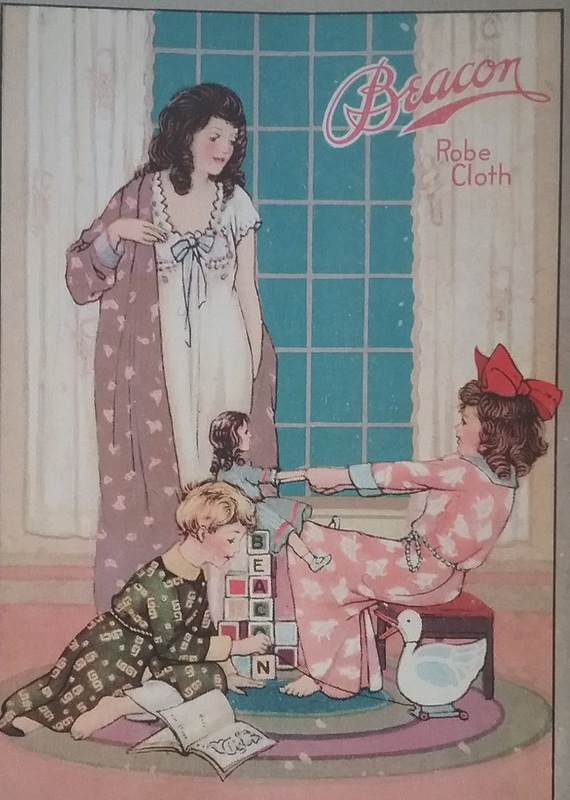 The cards with their little textile swatches are delightful, and give a great view of the types of fabrics available in 1915. Is cotton crepe even manufactured today? 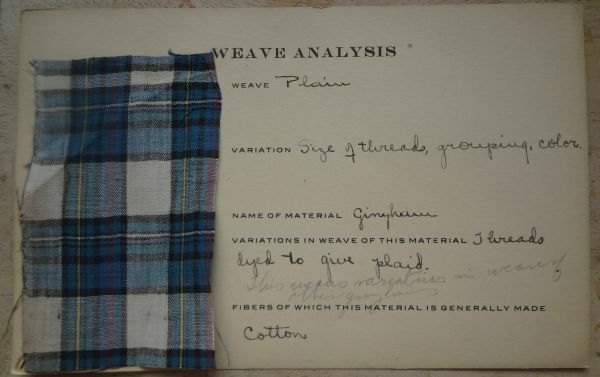 Some of the card describe weave patterns, like this plaid. Today we think of gingham as a two color, or most often white with a color, check. Once upon a time gingham was a stripe, but gradually plaids were woven, and today, the fabric is primarily made as a check. I wish I could say that I brought home all the cards, but that was not meant to be. 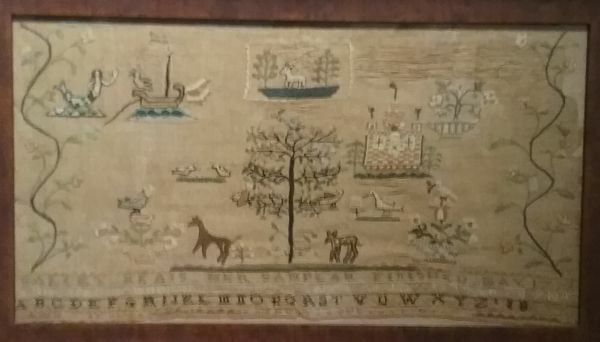 The estate company had priced these individually, and to have bought them all would have been around $300! Still, I did think it was worth purchasing a few as great examples of the type of work young women in home economics were required to do. I can just picture the girls in the local dry goods store, driving the proprietor crazy with their swatch collecting.